The ONLY fittings backed by a lifetime warranty. 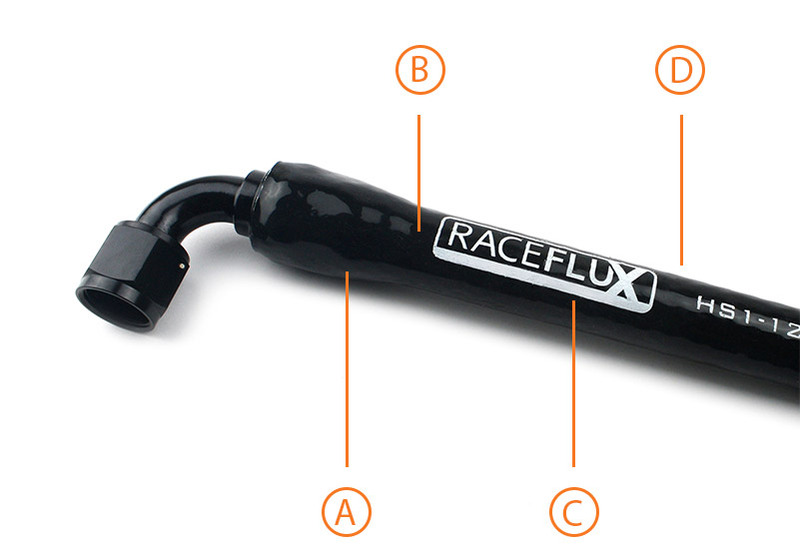 reliable, leak-free, high-flow fluid transfer for motorsport applications. 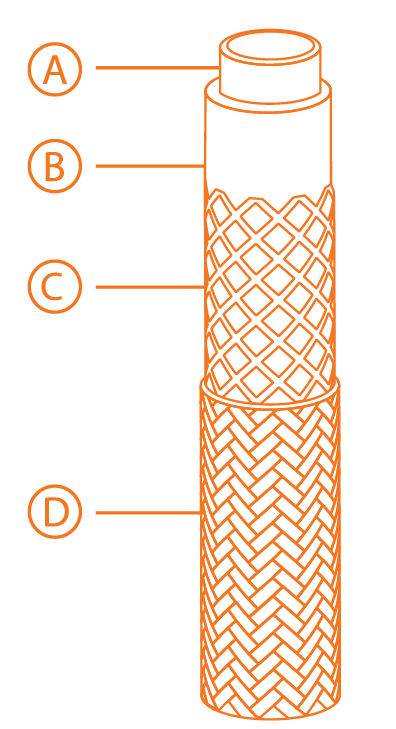 A left-hand threaded socket securely retains the hose during tightening. Compatible with virtually all oils, fuels and coolants. Acts as a fail-safe to prevent leaks and maximize reliability. For strength and corrosion resistance. Tubes are machined from a single piece of billet aluminum then mandrel-bent to eliminate brazed joints and improve reliability. All components are CNC-machined from aircraft grade 6061-T6 aluminum and MilSpec Type II anodized for extreme durability and corrosion resistance. 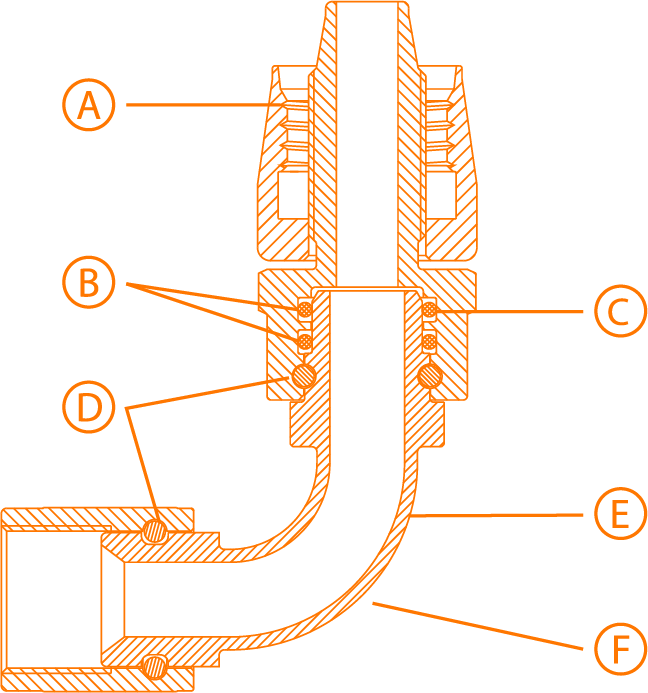 Viton inner bore for maximum fluid compatibility and a -40°F (-40°C) to 302°F (150°C) temperature range. Adds support to the bonded Viton inner bore and the embedded stainless steel reinforcement layer. Adds strength, cut resistance, resistance to kinking, and resistance to collapse under vacuum. Allows for a 1,000 psi (RH1 hose) or 3,000 psi (RH2 hose) burst pressure and 300 psi (RH1 hose) or 1,000 psi (RH2 hose) continuous operating pressure rating. RH1 nylon braided outer layer hose is abrasion-resistant, highly flexible, and 33% lighter than traditional stainless steel braided hose. RH2 stainless braided hose features a 1,000 psi max operating pressure and 3,000 psi burst pressure. wiring harnesses and cables from radiant heat and flame. Hook and loop closure (HS2) for easy installation and removal or fully stitched (HS4) for durability and higher temperature resistance. High-strength Kevlar aramid inner layer protects against abrasion and flame. Aluminized outer layer reflects 90% of radiant heat. Rated for 500°F (260°C) maximum continuous exposure, 1,000°F (538°C) maximum short term exposure. Silicone outer layer provides extreme protection from heat and flames. Fiberglass inner layer insulates components from radiant heat. Rated for 500°F (260°C) maximum continuous exposure, up to 3,000°F (1,650°C) short term exposure. *Applies to 90°, 45° and straight hose end fittings only. All components are CNC-machined from aircraft grade 6061-T6 aluminum and MilSpec Type III hard anodized for extreme durability and corrosion resistance. Adds strength, cut resistance, resistance to kinking, and resistance to collapse under vacuum. Allows for a 1,000 PSI burst pressure and 300 PSI continuous operating pressure rating. Abrasion-resistant, highly flexible, and 33% lighter than traditional stainless steel braided hose. 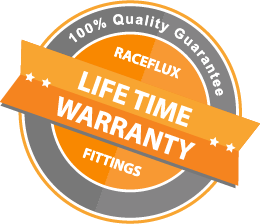 Race Flux Heat Shielding products are designed to protect hoses, wiring harnesses and cables from radiant heat and flame. 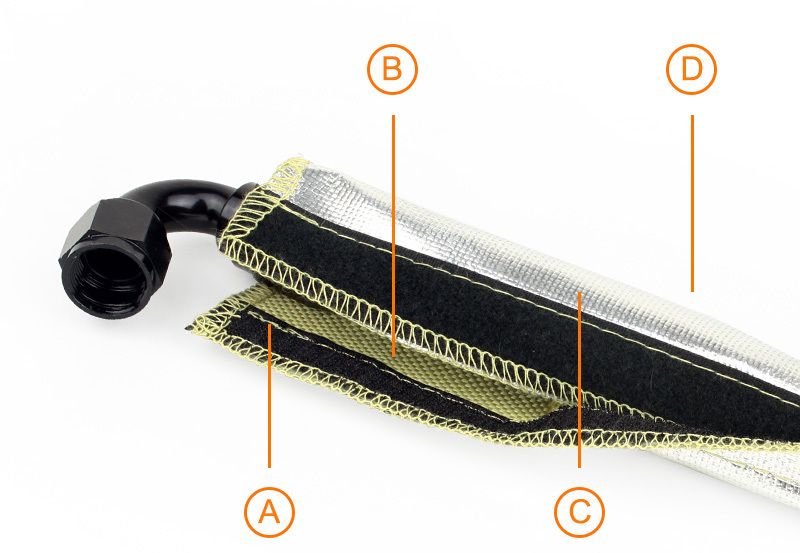 A | Hook and loop closure for easy installation and removal. B | High-strength Kevlar aramid inner layer protects against abrasion and flame. C | Aluminized outer layer reflects 90% of radiant heat. D | Rated for 500°F (260°C) maximum continuous exposure, 1,000°F (538°C) maximum short term exposure. A | Silicone outer layer provides extreme protection from heat and flames. B | Highly abrasion-resistant outer layer. C | Fiberglass inner layer insulates components from radiant heat. D | Rated for 500°F (260°C) maximum continuous exposure, up to 3,000°F (1,650°C) short term exposure. Copyright © 2019 RaceFlux™. All rights reserved.